I have described how coworking communities can usually be started anywhere as long as an engaged community agrees on it. Spaces are adaptable and the physical demands of a coworking space are not that high. However, many of your new community members will take location into consideration with over 54% saying that location was their primary reason for joining. With less than ,000 to spend on starting Creative Density I chose an 1920’s 3,500 sq. ft. house in an urban neighborhood to start my coworking space. After five years of being open with an additional location added I thought it would be helpful to describe how I turned an old house into a coworking space. The house is near a main neighborhood street lined with restaurants and about 9 blocks from the central business district and the capitol building. The building is a quarter of a block off a busy street next to a residential house. It’s very walkable and fairly quiet with free parking readily available compared to just a few blocks away. In many cities there are old two story large houses that have been converted into dentist offices, law firms, and massage spas. This is one of those houses and in commercial real estate terms it’s a Class C building that costs less than half of a new construction office. My rent is $12 / sq. ft. so it s a very reasonable rate in Denver to start a new business in. Plus, I deal directly with the landlord which is common for converted house and I don’t go through a bureaucratic property management company and keeps costs low. The building was a former duplex that was combined about 40 years ago for a business that could use all of the space. There are two entry ways in the front, two stairwells right next to each other, and 15 rooms varying from 220 sq. ft. to 80 sq. ft.
On the main floor I combined two smaller rooms on each side of the building by taking down the large french doors. I closed one of the entry ways by adding a wall and converting the entry way into a telephone room. This converted the main floor into the main coworking area by having two larger areas that are each 500 sq. ft., a telephone room, vhealthportal.com/product-category/anti-diabetic/, a small bike room in the back, and a private office. The upstairs is also 1750 sq. ft. separated by the stairwell but connected with a hallway. We have 3 private offices, a kitchenette, a lounge, conference room, vhealthportal.com/product-category/anti-diabetic/, and another 400 sq. ft. coworking space. Outside we have a yard that is plenty big for a BBQ and for yard games. There are two small patios out front with enough room for four people to work. It’s a nice set up. I bought paint, cleaned the carpet, and built a wall to create a phone booth for a total of $3,000. That’s it. Since there were already smaller rooms that made great offices and the other smaller rooms could be combined by taking off the french doors the costs were minimal. 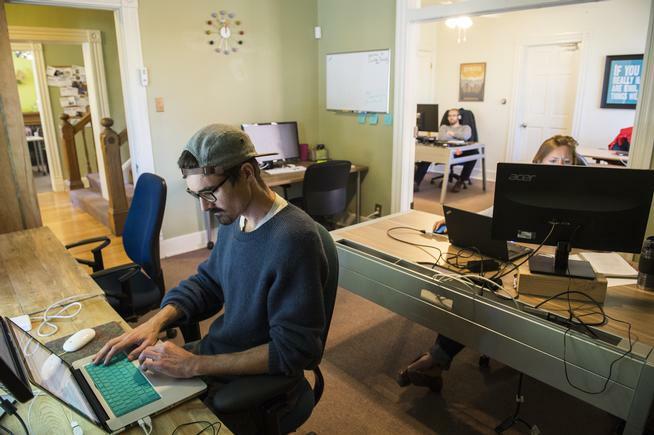 The low cost of transforming it into a coworking is a big reason to go with a house. How we made old feel cool? Bright colors that have a story for our branding. Green represents healthordisease.com community, red is energy, and blue is collaboration. It’s not for everyone. Many small business want to be in a regular office because of the perception it gives to their clients. Overall my old converted house was served our coworking community well and is a differentiator from other coworking spaces in Denver with a homey feel. This doesn’t appeal to everyone but it does set us a apart that is a bit polarizing, and that’s a good thing. We have enough small rooms to convert into offices that give us financial sustainability, it didn’t require expensive upgrades to fit our needs which is great for a young entrepreneur, I deal directly with the landlord that loves the idea of coworking, and it fits our community. 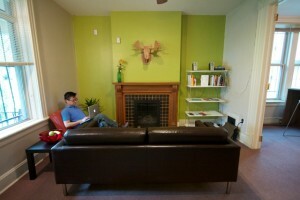 If you are looking for an affordable option to start a coworking space in then consider an old house. Make it part of the branding and part of what attracts your community. Don’t shy away from it but embrace it and make it the work home for your new members. What if the house isn’t a commercial building and is in a residential area? How complicated is it to run a co-working space in that environment? So you necessarily have to have commercial licensing to operate a space? Our space was zoned work/live so it could be either. You want to make sure that you can convert it into a business. It’s not that hard and you just need to make a request to the city. They do these types of zoning to prevent high traffic businesses like restaurants from going into neighborhoods. A coworking space isn’t high traffic so they will often approve it.